Little Dorrit: "Money can only give happiness where there is nothing else to give." Charles Dickens' Little Dorrit is a fable for our times. Originally published as a serial novel between 1855 and 1857, it could be inspired by the headlines of today's economic crisis. It is all about money - how society and government deal with its abundance and shortcomings - and the effect on the individual. If you think we should be more socially evolved since this tale appeared one hundred and fifty years ago, think again. Sadly, "Those who cannot remember the past are condemned to repeat it." Too true! When Dickens embarked on his eleventh novel, he was an established 'best selling' author of his day motivated to expose the current crippling bureaucracy and social injustices that were plaguing Britain in the 1850's. As with his other stories, he draws heavily from his own life experiences as a child. Little Dorrit is a huge, sprawling story set in the 1820's England where the penalty for financial insolvency is imprisonment, a topic very close to his heart since his own family (like the Dorrit's) were imprisoned at Marshalsea prison for debt. The novel totals over 750 pages in my Oxford World's Classic edition, and I must confess to being more than a bit intimidated by its size when it landed on my doorstep. In preparation for the Masterpiece Classic presentation, I chose instead to listen to a 35 hour audio book (which was still a monumental, but enjoyable endeavour) and found an excellent unabridged edition from Naxos read by Anton Lesser. In comparison, the BBC/PBS adaptation at 7 and a half hours seemed a breeze! Davies has done an excellent job of condensing the story, though some might find some of the subplots and minor character associations a bit hazy. Understandable, considering the complexity of this story. The good people at PBS have done any excellent plot and character analysis available on their Little Dorrit official website if you get lost! Episode one is all about the older generation and how the two parents William Dorrit and Mrs. Clennam's life choices have imprisoned their children by their mistakes. William Dorrit, respectfully called the "father of the Marshalsea" is played by two time Academy Award nominee Tom Courtney who aptly presents him like a fading Shakespearean actor puffed up by playing Kings so many times that it is now part of his personae. Mrs. Clennam, the stony paralytic matriarch of "The House of Clennam" also played with courtly authority by Judy Parfitt, (who will always be Lady Catherine de Bourgh for me since I enjoyed her performance in the 1980 Pride and Prejudice) delivers a performance worthy of Medea, the wife of Jason in Greek mythology who when scorned by her husband, embarks on the ultimate act of revenge, killing their children. Her searing blue eyes are like death rays to all she looks down upon, which is pretty much everyone, but angelic Little Dorrit. Her son Arthur Clennam and William Dorrit's daughter Amy are both victim's of their parent's bad choices. Arthur, by age 38 recognizes his unhealthy indenture to his mother and breaks away from his debt to her for his upbringing, education and the only job he has every had in the family business. Inspired by the innocence and devotion of Amy Dorrit, a young woman who has chosen to serve others at her own expense, he is revitalized into starting a new life for himself, all the while trying to discover the mysterious connection between his fathers's dying wish and the Dorrit family. Amy 'Little Dorrit' at 22 has yet to understand the shackles that her birth and life in a debtor's prison have bound her to since she has experienced little else. Though their families and society have imprisoned them, their individual spirit and resolve guides them through their difficulties. This is the thread of hope that fuels this dark story. Through these two characters, Dickens shows us that even under extreme adversity, that the individual and society can renew itself. Though Dickens pen dwells on guilty and misery like no other can, this fable is also about facing temptations and what we do with them. How we are emotionally and financially in debt to society and our families from the day we are born. How honor and virtue can save us. Oh my! This is sounding like a sermon. Dickens would approve. He was a strong social activist, using his novels as a sounding board to reach the public and rally change. So, as we look closely at Dickens tale of temptation and avarice over the next five weeks on Masterpiece Classic, and are painfully reminded that Ponzi schemes and bankruptcies are as old as the ages, it is reassuring to know that Little Dorrit does have a happy ending. It is about hope, love and renewal of the individual spirit and society. While some will continue to think "a large income is the best recipe for happiness" I will look beyond the power of pewter and believe "money can only give happiness where there is nothing else to give." 750 pages! Goodness, I'll happily tackle the Masterpiece Classic first. You have definitely peaked my interest! Well done, Laurel Ann. I enjoyed the film hugely, but I agree with you that the minor characters seem hazy and confusing. Still, Little Dorrit is inspiring and interesting, and the movie does not seem at all preachy. That was an awesome review of this movie. Little Dorrit is really an amazing story over the hundreds years. I would probably watch this film. Thanks for sharing! I was deeply impressed with the cinematography in this first episode. In many of the bleak oppressive interiors only the food had rich color. If the camera lingered on a scene, the color often grew more vivid. It was a very satisfying effect, to see how color was used in such odd but powerful ways. Especially green. Where the camera is placed in the scene is also interestingly done. Did anyone notice how the camera tracked Flintwinch and his cronie when the wooden box is taken from the Clennam home office? There are many examples of the camera insinuating itself in an unusual way when people are misbehaving. These techniques are made all the more evident when viewed against scenes of the countryside where the lighting and angles are used in a more traditional "masterpiece theatre" way. I can barely wait until next Sunday night to SEE what happens next! Marvelous cast. Deeply complicated story, well laid out. Good music. Excellent production values. Best of the Masterpiece Theatre productions that I have seen -- and I have seen them all. The producers'/directors' capabilities, over time, have grown and deepened and what we see is more than Dickens intended. Tom Courtenay is remarkable. 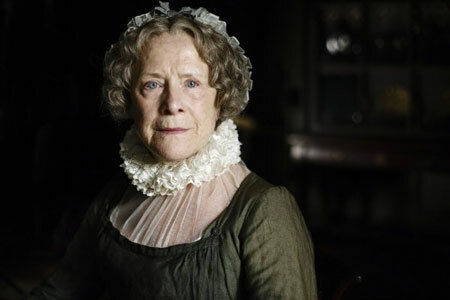 Laura Linney was mistaken in last night's introduction when she said that Flora was based on Dickens's wife. She was actually based on his girlfriend from his youth, Maria Beadnell. The introduction made it sound as if Dickens said some really cruel and heartless things about his wife. While he wasn't a great husband and did do some hurtful things, he never spoke like THAT about her, to the best of my knowledge, and at least tried to show some respect for her in public. I wish PBS would issue a correction about this. It left a very bad impression. Thank you for your interest in “Little Dorrit.” In writing the introduction various sources were used, including “Dickens and Women” by Michael Slater. Maria Beadnell is cited in alternate sources (as you suggested) as the basis for Flora, and therefore we have forwarded your comment on to the writer. I found this series to illuminate the tragedies of the old world of classes.Dickens saw this disparity,and now some 150 years later,we still suffer from the same ignorance.I look forward to next Sunday with anticipation. By making Tattycoram black and (apparently) a slave and Mr Meagles (apparently) a slave master, you have perverted Mr. Meagle's charitable act of rescuing Tattycoram from an orphanage into an act of oppression. Why? I'll grant you small liberties like a Pancks sans hair as long as the spirit of the character is preserved (which in Pancks' case well done and bravo), but to needlessly present Tattycoram thus is to (apparently)stray into what Harold Bloom would term the "School of Resentment": foisting your agenda onto an unsuspecting public who in the majority will never read this masterpiece and thus will never know the true Dickensian portrayal of Pet's maid and Mr. Meagle's noble heart. As Ms. Morely said above this is truly "more than Dickens intended:Fi! Fie! for shame: but for all the other wonderful elements of your portrayal I'll be watching anyway: can't help myself! I greatly disliked the fatphoic nature of the introduction to Little Dorrit's concluding episode. To harp on the fact that Mrs. Dickens went from being plump to fat and that his second wife was thin and therefore more desirable is swallow, unnecessary and displays considerable prejudice. PBS, which prides itself on being so pro-diversity, fails miserably in the realm of size diversity. Little Dorrit is about so much more than having a wife who became fat over bearing her husband ten children!! But after hearing this and many of the introductions, one would think Little Dorrit was written for that main purpose. that oh so secret box). Was there a brief shot of Tatty carrying her bags down the lane to the Meagles's home? Why would Arthur seek out Mrs. Wade in his quest to find Rigaud? What's the basis for the connection between Flintwinch and Rigaud? And the corker: who was Arthur's biological mother, the first Mrs. Dorrit? On the other hand, the collapse of the House of Clenham looked stunning. Of course all my confusion could be viewer related, but things wrapped up with Dickensian symmetry but without the clarity he brings to every plot, every novel. Pet and Jack? Well after the baby was born, they dropped out of the picture, literally. It would seem that the baby would make their marriage a bit rocky from his reaction to the son's birth. They are not central characters to the plot after Amy leaves Italy, so not adding them to the conclusing episode is not vital to the storyline. Ms. Wade apparently allows Tattycoram to leave (and to take the box with her). Remember that Arthur had already met her earlier, so she may be well aware of the will in the box and felt that he should be given that information from Tattycoram. Arthur looked for Ms. Wade in his search for Rigaud because he saw Rigaud talking to her in the streets in an earlier episode just before she entered Mr. Casby's residence. Flintwinch and Rigaud have no connection. Rigaud happened to come across Jeremiah Flintwinch's twin brother in a pub and the twin brother was carrying the will inside the box and Rigaud murdered him for its contents. That is why Rigaud went to Mrs. Clennam for blackmail money. Arthur's biological mother was the poor dancer who died in prison. When Rigaud confronts Mrs. Clennam and tells the whole story regarding Arthur being illegitimate and that Mrs. Clennam had taken the baby boy away from the real mother (dancer) and then raised him as her own son to "wash the sins" of her husband and his dancer lover. my reading list. But note: "Mrs. Wade 'apparently' allows Tattycoram to leave . . ." That "apparently" defines the plotting problems with the TV adaptation. Did you ever truly understand Mrs. Wade's obsession with Tatty? Was the lesbian undercurrent intentional? And how did the Meagles's come by Tatty in the first place. trust that Dickens will bring all to light this summer. My dear husband & I are very much enjoying watching the series at our leisure. We both feel the same way, "isn't it interesting to be so very 'poor' then find oneself so very 'rich'." The question is "rich in what"? I am now very anxious to do more reading about "Charles Dickens & his writings". Lovely series, we want more like this, thank you. Please comment on the subject of the blog post itself. If you do not follow these rules, we will remove your post. Keep it civil, folks! Two years ago we established the "Remotely Connected" initiative, where we have invited a diverse group of bloggers to comment on/write about/review a variety of PBS programs. We see Remotely Connected as a way to present unique voices to PBS' audience and to promote discussion in the community. Join the conversation. Check out Interviews with David Tennant, Patti Smith and many others from PBS Presstour. MASTERPIECE Mystery! "Agatha Christie's Miss Marple"
MASTERPIECE CLASSIC "The Diary of Anne Frank"